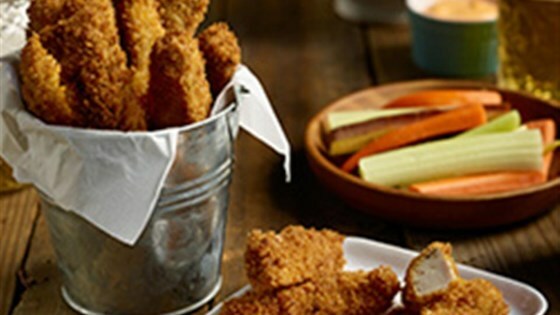 "Thin strips of seasoned pork tenderloin with a panko crust are fried up, crisp and delicious, and served with your favorite dipping sauces." Remove tenderloin from packaging and place on cutting board; cut into 3 equal length sections, each about 3 inches long. Slice each section into 1/4- to 1/2-inch diameter strips. You will end up with approximately 34 strips that are similar in size and shape to French fries. Place eggs, breadcrumbs and flour into separate bowls. Dredge pork strips in flour, coat with beaten egg, and toss in breadcrumbs. Pour oil into large skillet until 1/4 inch deep; heat over medium-high until breadcrumb dropped in oil sizzles. Gently place approximately 8 breaded pork strips into oil, making sure not to overcrowd them. Fry approximately 1 1/2 minutes per side until golden brown, crisp, and internal temperature of pork is at least 150 degrees F.; drain on paper towels. Repeat until all pork strips are fried. Note that stove temperature may need to be reduced to prevent burning when the oil level lowers after a few batches. Serve with BBQ sauce, sriracha mayonnaise, or ranch dressing for dipping. I followed this recipe until cooking. I baked them at 450 for 10-15 minutes. Still came out crunch and fry like. All my family loved them!!!! Baking it is a good alternative for a healthier meal. I used pork chops cut into strips and then added salt, pepper, and a little garlic powder to the flour mixture. My family loved this dish! tweaked recipe but still food nonetheless. I assume this dish would be great following recipe exact. 4 eggs does seem but much tho, I used 1. Like chicken fingers. Kids loved it. Not too difficult but takes a long time to fry them if you make a lot. I'll try baking them next time. Turned out great. The whole family ate them up.